This is one of the most famous Buddhist centers of India and is located 6 km north of Hindu pilgrimage center Benares - in Uttar Pradesh, near the highway to Ghazipur. There are four sacred Buddhist pilgrimage centers in the Indian subcontinent. The first of these is the birthplace of Buddha at Lumbinivana, east of Kapilavastu. The second most sacred place of pilgrimage is Buddha Gaya where he attained enlightenment. The third most sacred pilgrimage center for Buddhists is Sarnath or Isipatan where Buddha delivered his first sermon, and the fourth is Kushinara or Kashia in Uttar Pradesh, where he finally gave up his mortal self. The earliest remains here at Sarnath are from the Mauryan period ascribed to Emperor Ashoka the great. The Lion Capital is the national emblem of India. 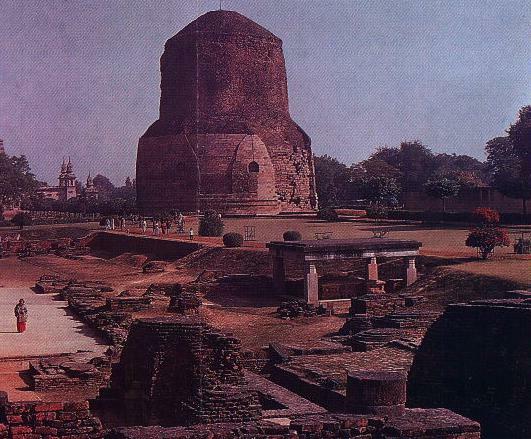 The Dharmarajika Stupa was built by Ashoka, and it was expanded and enlarged several times upto the 12th century CE. The structures here were destroyed by repeated invasions - and by gradual neglect - and what are seen today are the results of repeated reconstruction efforts. The Dhamekh stupa is a cylindrical tower, 143 feet high, and 93 feet high. The stones in each layer were bound together by iron clamps. This tower dates back to the Gupta period. The Chinese traveller Hsuen Tsang who visited India in the 7th century CE, speaks of the glory of Sarnath and of the structures that existed then. A modern temple to Buddha has been built here in the 20th century, housing several of the Buddhist relics excavated here. On Buddha Purnima, the birthday of Buddha, relics of the Buddha are taken out in procession. The archeological museum at Sarnath houses several Buddhist sculptures and relics. The Mahabodhi library here houses a rich collection of Buddhist manuscripts and writings.